Now here’s a bunch of guys that do not want to conform to only one genre of music. They sail the electric oceans of distortion where ever the underground currents of inspiration may bring them. It could be Punk Rock just as easily as Hard Rock. Take a sidewind of Garage Rock and blow straight back to Glam Rock. Give them a couple of beers and they jam hard into Pub Rock. Now what do you call a band that’s not afraid to tap into any kind of subcultural guitar phenomenon and blend it into one solid sound? 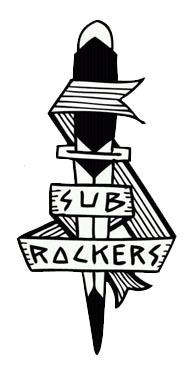 That’s right: SUBROCKERS!And it’s SUB ROCK they play!